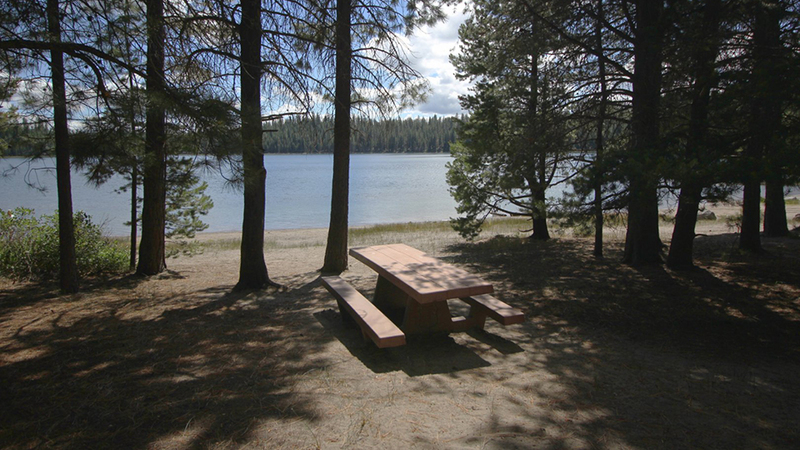 Located approximately 42 miles southeast of Bend, North Twin Lake Campground is the little sister of neighboring South Twin Resort. North Twin Lake has an interesting history, as it was created by steam explosions, caused when hot volcanic magma hit groundwater. What remains is a great place for swimming, fishing for rainbow trout in the summer and winter, or relaxing on the little beach at the shallow end of the lake. North Twin Lake allows non-motorized boats and there is a boat launch within the campground. The tranquil waters are also great for kayaks, canoes, and paddleboards. To turn your camping trip into a teaching moment, visit the interpretive trail leaving the campground near the water and learn about “dwarf mistletoe” infecting the ponderosa pine trees in the area. North Twin Lake Campground is made up of 20 shady, single sites. Reservations are not taken, but the campground rarely fills up. There is an RV dump station just after the entrance toward Gull Point and vault toilets serve the entire campground. The per night, per site fee is $14 for the first vehicle, and $7 for each additional vehicle, and the campground is typically open early April through late October.